In these vacuum-tube-powered pages I have previously rhapsodized on the artfulness and smoldering spiritual utility of Jack Chick tracts. Without them, young Evangelicals would be far less afflicted, and who needs that? I read it immediately and discovered that the main character, John, had some misgivings about organized religion. For that, he died and is, as we speak, being cooked in hell. His wife and children, however, paid obeisance to the relevant jurisdictional authorities and were similarly rewarded with death. 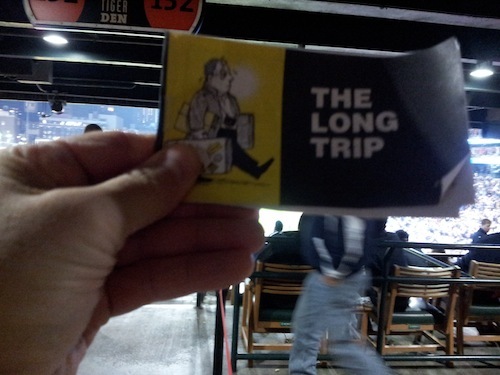 Know this, rat-sinner, if you go to a ballgame, a wind-blown Jack Chick tract will find you. We hoped you liked reading Spotted: ALCS Jack Chick Tract by Dayn Perry! Are you sure those don’t just spill out of the Ty Cobb statue?